Lenin's plan of peacefully building a socialist society was frustrated by the Civil War (1918-1920) unleashed by the counter-revolution within the country and by armed intervention undertaken by the aggressive forces of Great Britain, Germany, Italy, the USA, France, Japan and other countries. On a map titled "The Young Soviet Republic: Enemy Encirclement. 1918 — March 1919", one can see that the Soviet state was cut off from its vital sources of food, raw materials and fuel. Difficult as the times were for the young Soviet country, Lenin appeared frequently before the workers and Red Army men. On August 30, 1918, after one such meeting at Moscow's Michelson Plant (now the Lenin Electromechanical Plant) an attempt on his life was made, and he was gravely wounded. Documents on display convey the alarm and concern with which the working people in the country and throughout the world followed Lenin's convalescence. On the advice of his physicians, Lenin moved to a country estate at Gorki near Moscow. Due to the tremendous organisational work of the Party's Central Committee under Lenin's leadership as well as to the heroic efforts of the working class and the staunchness of the Red Army, the Soviet republic withstood all trials. This section features a map titled "The Struggle of the Soviet Republic Against the Counter-Revolution and Foreign Intervention, April 1919—March 1920", posters of those years, numerous photographs, and the banners of five Red Army units that fought in the Ukraine during the Civil War. Materials showing the heroic efforts of the working people during the Civil War are also exhibited in the museum which boasts a first edition of Lenin's article "The Great Beginning" (1919) devoted to the emergence of communist subbotniks. By "great beginning" Lenin had in mind the voluntary, unpaid work of the working people on their days off describing it as a politically conscious attitude toward labour. In documentary photographs, the visitor can see Lenin taking part in the All-Russia subbotnik, held on .May 1, 1920, and attending the ceremony to mark the founding of the Emancipated Labour monument. A special section contains documents illustrating Lenin's style of work. A wealth of material speaks of his deep concern for people in every walk of life including a decree of the Council of People's Commissars ( the highest executive body of state power) on relief for the population of the Kremenchug region (the Ukraine) suffering from the damages after a disastrous flood; his telegram to a needy peasant woman, Yefimova, notifying her of forthcoming help; his letter to Maxim Gorky begging the great writer to "undergo medical treatment". With the end of the Civil War, the Party, under Lenin's leadership, embarked up on a decisive course to create the material and technical basis of socialism. In 1920, the Soviet state developed its first long-term economic program based on Lenin's plan to provide electricity to the whole of the country (GOELRO). The materials on the 8th All-Russia Congress of Soviets which adopted the GOELRO plan are extensively represented in the museum. This section contains exhibits devoted to the Soviet Ukraine, photographs of young Komsomol members working during subbotniks and of Komsomol volunteers from Chernigov region leaving for the front lines, and documents illustrating the restoration of the Donbas coal fields and the iron and steel industry in the South of the Ukraine. The presents and gifts Lenin received are also on display here and speak eloquently of the Ukrainian people's love and respect for the head of the Soviet State. The last years of Lenin's life are associated with the preparation for and work of the 11th Party Congress (March 27—April 2, 1922). It was the last congress in which he took part. Confinement in prison, exile, the wound he suffered from after the attempt on his life in 1918, and uninterrupted work took their toll. On the advice of his physicians, he moved again to Gorki for lengthy medical treatment and rest. On November 13, 1922 he made a report to the 4th Congress of the Comintern, and a week later spoke at the plenary meeting of the Moscow Soviet. This section in the museum displays photo-copies of the manuscript of his speech and its printed version in Pravda. As Lenin's health worsened, his doctors insisted that he work less, yet he continued to guide the Party and the state, and was greatly involved in the completion of the unification of the national republics into a multi-national Soviet Socialist State. On December 30, 1922 the 1st All-Union Congress of Soviets was held in Moscow. Lenin did not attend the congress because of poor health, but he was elected honorary chairman of the congress. There is a photo-copy of the manuscript of his last speech, one which he was unable to deliver at the congress. Though he was absent from the congress, his great wish — the adoption of the Declaration on the Formation of the Union of Soviet Socialist Republics — was materialised. This Union originally comprised the Russian Soviet Federative Socialist Republic (RSFSR), the Ukrainian SSR, the Byelorussian SSR, and the Transcaucasian Soviet Federative Socialist Republic (TSFSR) which was later divided into the Azerbaijan SSR, Georgian SSR, and Armenian SSR. A specially equipped stand features a map of the boundaries of the Union republics, and there are also models of their emblems. 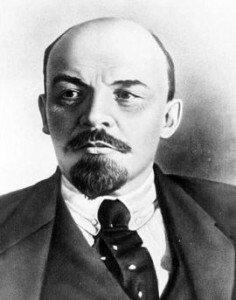 Vladimir Lenin passed away on January 21, 1924. A group of exhibits devoted to his untimely death and his funeral evoke a feeling of deep sorrow. There is a governmental communique on his death, the appeal of the Central Committee, "To the Party. To All Working People", photographs of the room in Gorki where he died, the first guard of honour at his coffin, processions of mourners in Gorki and Moscow, and newspaper articles dealing with the response of the Soviet people to the death of their head of state. Here the visitor can see the model of the Lenin Mausoleum built in Moscow's Red Square in 1930 to the design of architect Alexei Schusev, a pedestal with the plaster cast of Lenin's death mask made by sculptor Sergei Merkurov, and wreaths from the working people of various cities. The last section of the exhibition on the third floor deals with the ever-living Lenin's ideas and the development of Leninism at the present stage. Diagrams, charts, photographs, models of industrial projects and machines, and other materials demonstrate the development of Soviet industry and the implementation of Lenin's plan for industrialisation. Many of the exhibits show the changes that have taken place in the Soviet countryside and illustrate the development of science and culture in the USSR. A large space is devoted to documents on the achievements of the Soviet Ukraine. The internationalist nature of the Soviet state is reflected in that part of the exhibition based on the theme, "We, the Soviet People", picturing the life of the Union republics of the USSR. Rows of showcases exhibit Lenin's writings translated into the languages of the peoples of the USSR and the world, works which have been published in this country and abroad.